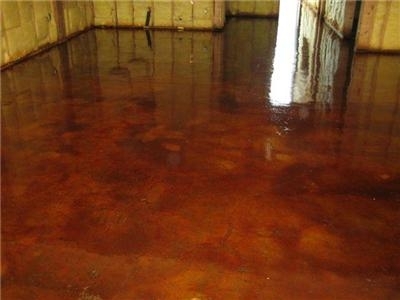 Acid staining is using a special stain mixture to produce a chemical reaction between an acid stain and concrete. 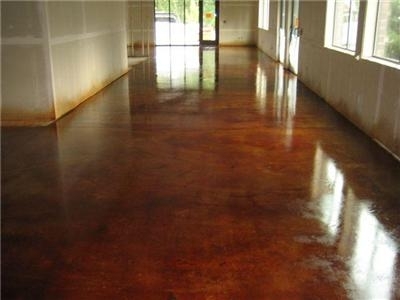 The chemical reaction of acid staining is what makes the color durable, because it actually changes the color of the concrete. What can be acid stained? 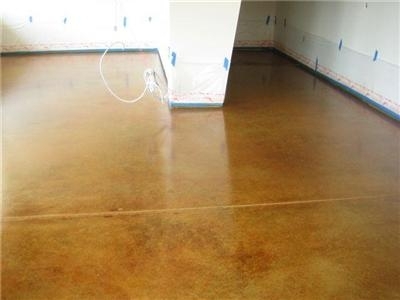 Patios, driveways, countertops, floors, and anything concrete can be acid stained. How much does acid stain cost? The price of acid-staining depends on the size of the area to be acid-stained. What if there is glue from carpet or other flooring? The concrete can be stripped with a stripper (our company uses a soy-based stripper so we can be "green"), ground, scarified, or shot-blasted. Now it's almost ready to acid stain. 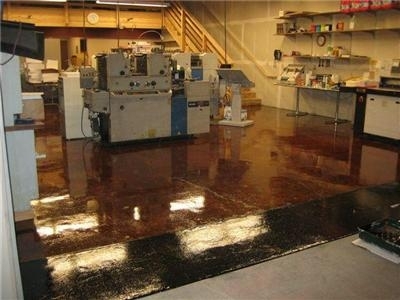 What is the preparation involved in order to acid stain? The object is to open up the pores of the concrete so that the acid stain can penetrate and make contact with the lime and/or calcium elements. Therefore, we need to degrease, sand, and scrub like crazy. Grease is the number-one enemy of acid stain. Should acid-staining be done before sheetrock or after? Acid staining is best done before the sheetrock or stud walls are framed. When acid staining, a lot of water and degreaser is required to prepare the floor, potentially resulting in damage to the sheetrock. Furthermore, the floor needs to be protected from grease, wax, and other contaminants (i.e., dirt, glues, red chalk, pencil marks, paint, sheetrock mud, and texture). Other subcontractors (plumbers, sheet rockers, carpenters, and electricians) use these things. In carpet and tile applications, it does not matter if they contaminate the floor. However, when acid staining, the floor becomes a canvas for art. It needs to be protected, and a double paper cover from wall to wall works very well (never put tape on the newly sealed floor - even low tack blue tape). Sometimes it is not possible to do the acid stain first; therefore, it should be done before interior doors and trim is installed so that the acid stain can be wall-to-wall without damaging the wood trim and door casings. There is also less taping and masking if it is done before texture and paint, so it makes your acid stain job cost less. If you are even considering acid staining your floors, contact an acid stain specialist rather than trying it yourself. Botched acid stain jobs are difficult to fix! How long will the acid stain last? 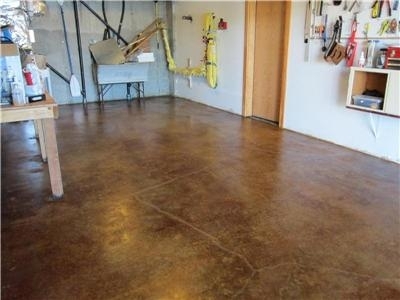 The acid stain will last as long as your concrete if you keep it clean and maintain the sealer with wax coats. What are other floor options as opposed to acid staining? 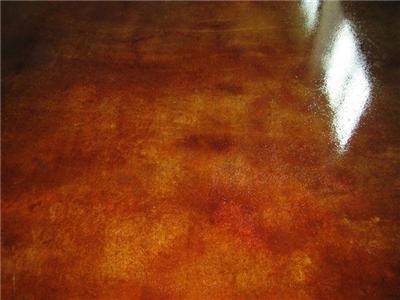 Three dimensional metallic epoxies (3D) are very popular now. 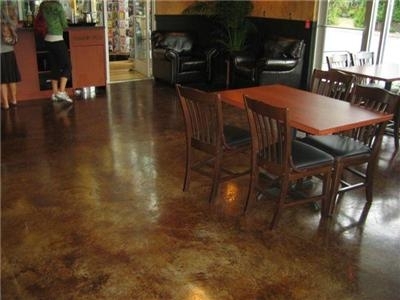 Other options are Smith color floor; solvent dyes and stains; polishing and densifying; stenciled tiles; or stamp overlay. How long does acid staining take? Of course, size and access are key. Two to five days is typical. 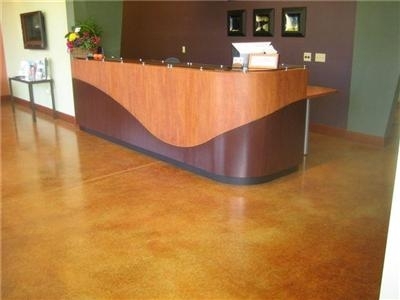 What types of sealers are available once acid stained? Acrylic is the most common (it is breathable, durable, and affordable); polyurethane (it is UV-stable, and chemical and scratch resistant); epoxies; and polyaspartics (polyaspartics have 3 times more abrasion and impact resistance than epoxies and urethanes and are extremely chemical resistant). Most of these have low or no VOC, water-based options. 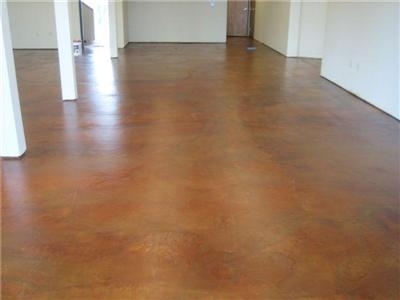 What is the maintenance for acid stained floors? Keep it clean! Walk and wear wax is a valuable tool that can be applied with a micro fiber mop and does not need to be buffed. It is excellent for maintaining traffic areas. What other types of stains are there? Water based stains, solvent borne stains, polymer stains, and acrylic stains (some soak in and penetrate, while others sit on top and are topical).